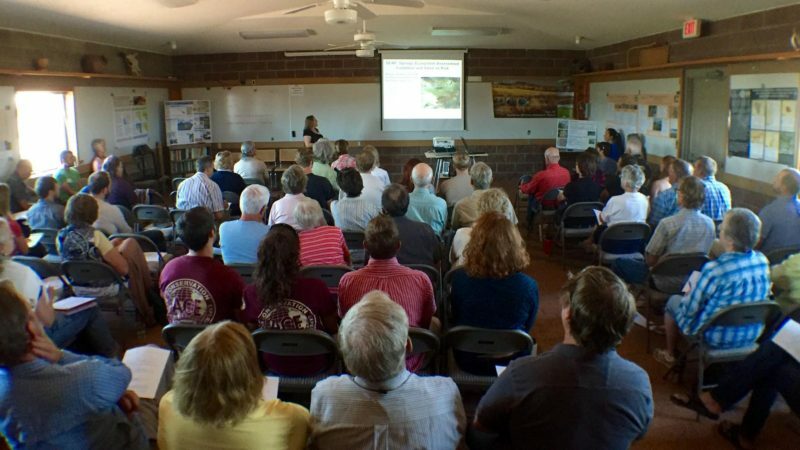 The Science on the Sonoita Plain Symposium is held annually to share results of scientific investigations and land management activities that are occurring within the upper watersheds of Cienega Creek, Sonoita Creek, and the Babocomari River. The SOSP symposium encourages exchange among scientists, land managers, local landowners and citizens about the unique and diverse resources of the Sonoita Plain. The SOSP symposium is sponsored by the Cienega Watershed Partnership and National Audubon Society with support from partnering organizations, The Nature Conservancy and U.S. Bureau of Land Management. The Science on the Sonoita Plain Symposium has been held annually for the last nine years to share results of scientific investigations and land management activities occurring within the upper watersheds of Cienega Creek, Sonoita Creek, and the Babocomari River. The 2018 annual meeting is the 10th year of promoting exchange among scientists, land managers, local landowners, interested citizens, and students about the unique and diverse resources of the Sonoita Plain. The Symposium is co-sponsored by the Cienega Watershed Partnership, the Appleton-Whittell Research Ranch of the National Audubon Society, the Nature Conservancy, the University of Arizona, Sonoran Institute, and the Bureau of Land Management. This special year, our morning sessions will focus on a ten-year retrospective review of pertinent topics such as water, climate, birds, ecosystems, institutions, and cultural heritages. In the afternoon, as usual, we’ll offer a range of presentations on current research and project activity. At the end of the day, to celebrate our 10th anniversary, we’ll offer cake and ice cream and some related fun. While the Symposium is free, please note that space is limited, so we encourage you to register early to reserve your place. Deadline for submissions is March 15, 2018. Please indicate clearly in your submission whether you would prefer to do a full presentation or a poster (or if you are open to either option).